Ages 4 through 11. 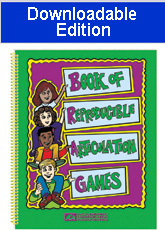 Here is a collection of reproducible games for teaching speech sounds and remediating phonological processes. Games are included for /b/, /ch/, /d/, /f/, /g/, /k/, /l/, /p/, /r/, /sh/, /t/, /th/, /v/, and clusters. Bingo-type games, rhyming games, and verbal reasoning activities are included. Each set of bingo boards includes three boards for practicing the target sound in word-initial position and three boards for practicing the sound in word-final position. The pictured items are arranged in a different sequence on each of the three boards. The book also includes "Guess the Word" worksheets. The activities require students to use clues contained within an incomplete sentence to identify a missing word that contains the student's target sound. Rhyming Fun and Change the Sound Games are also included.